Mites and acarids? Eliminate heat and sweating! 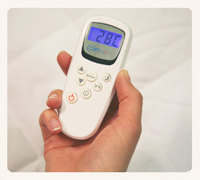 CLIMSOM allows you to cool the place where you sleep: the surface of your mattress. It is an essential key to fighting acarids. 5 percent of people are allergic to mites. Half are seeking treatment. Mites cause 44 percent of allergies. They are the second most common source of allergies after pollen. These allergies appear more often in fall and winter because the weather is damp and we heat indoors more. By cooling the mattress and limiting the sleeper's night sweats, the CLIMSOM mattress topper fights mites naturally. (...)I complete my letter to you by mentioning my acarid allergy. The bedroom had to be treated every two months with insecticide, but this is unhealthy, noxious, and environmentally unsafe. For the past five months, though, this has not been necessary, and I have not had any allergic reactions. I waited to write to you until I saw the effects of this device in the long term. I can only say one thing: I cannot be without CLIMSOM, and I sincerely thank the doctor who developed this concept.